Located in the Cathedral of the Deep, the congregation of clerics defends a roaming soul, that is eventually revealed to be the Archdeacon. 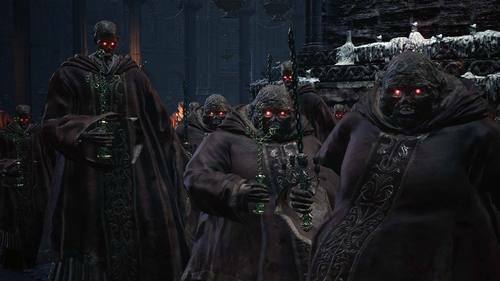 Soul of the Deacons of the Deep. One of the twisted souls, steeped in strength. Use it to acquire many souls, or transpose to extract its true strength. 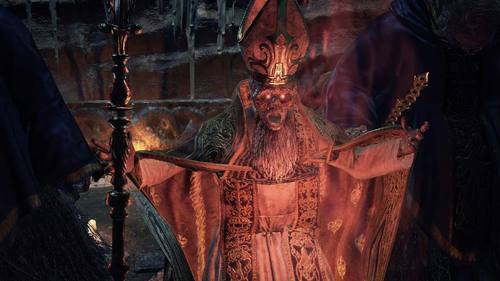 After Aldrich left for the Boreal valley, Archdeacon Royce remained in the cathedral with the high priests, to keep eternal watch over their master's coffin. Sorcery of Archdeacon Royce and his deacons, said to have been imparted to them by McDonnell of the Boreal Valley. Souls which swell from the deep pursue their target, drawn towards life. Candle stick used as both sword and catalyst. Used for worship by the Deacons of the Deep. The deacons, under the guidance of Archdeacon McDonnell, became both Clergymen and sorcerers. Armor worn by an Archdeacon of the Cathedral of the Deep. Presented solely to delegates of the gods. A sign of the Way of White's highest rank. Of the three Archdeacons of the Deep, one stood over Aldrich's casket, with hope that he would return one day.